After 40 years in operation, Northern Pacific's "Queen Anne" style passenger depot built in the Fall of 1882, the building started to show its age. After a new depot was built in Bismarck, local business leaders lobbied the NP to replace Mandan's depot. A major fire in June 1920, caused by defective electrical wiring, destroyed the entire wood second story of the building including the offices of Western Union Telegraph, yardmaster, roadmaster and trainmaster. Temporary offices were set up in extra caboose cars parked on rail sidings. Since the Railroad was loosing money at the time, it decided just to rebuild the second floor with a very plain design. After receiving a new coat of paint, the line would operate this depot until 1929. In 1928, Chief Engineer Howard Stevens made a bold move and proposed replacing the existing lunchroom and depot with a series of 3 buildings based on a brick colonial design. It was unlike any existing NP depot in the country. Despite also being presented with a more traditional NP depot design, the Board of Directors approved the new design. For a bid price of $61,342 ($775,000 in 2010 dollars), the Steen Company of Grand Forks built the current depot. It was constructed just north of the old one. 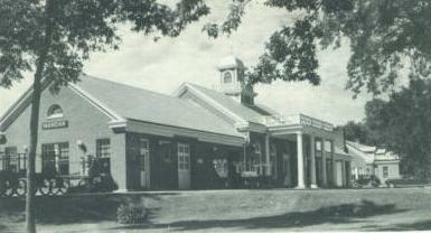 After the dedication in February 1930, the old depot and lunchroom were demolished and new tracks and a platform were built in its place. The building is one story high, built of red brick and is 34 feet wide and 156 feet long, including a 22-foot covered platform at the west end. The building originally was configured to include a general waiting room 32 ft x 30 ft, a women's rest room 13 ft x 26 ft, a smoking room 11 ft x 17 ft, a baggage room, 22 ft x 32 ft, an express room 32 ft x 30 ft; toilets, etc. No basement was necessary as the steam for heat was initially furnaished from the nearby engine terminal power plant and subsequently by a steam boiler installed in the basement of "The Beanery" building built in 1928 as the food service concession to the west. The colonial design is brought out by columned porticos at each main entrance. The effect is enhanced by the open balustrade that surmounts each portico and in the depot by the arched transoms of the two main entrances of the flanking windows. 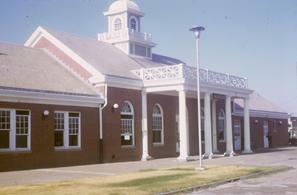 An added feature of the depot is a cupola in the colonial design accented by and encircling balustrade. The arched windows and broad fireplace chimney at one end of the lunchroom complete the effect. Only the depot and beanery were built. The railway's management opted to move the offices destined for the third building to open space on the second floor in an existing freight house building. The freight house was remodeled in the 1970's to serve briefly as a call center. Today the freight building houses the Morton-Mandan Library on the main floor with a restaurant on the east side's second floor. After the final passenger train service was terminated in 1979, buildings were turned over to the City of Mandan. In 1992, both the depot and beanery were remodeled and leased to area businesses. In 1995, the Fort Lincoln Foundation moved into the building with both its administrative offices as well as its retail operation Five Nations Art Gallery. In September 2017, it started its latest chapter as home to a German-style beer hall and restaurant with the art gallery moving next door into the smaller former NP Lunchroom.